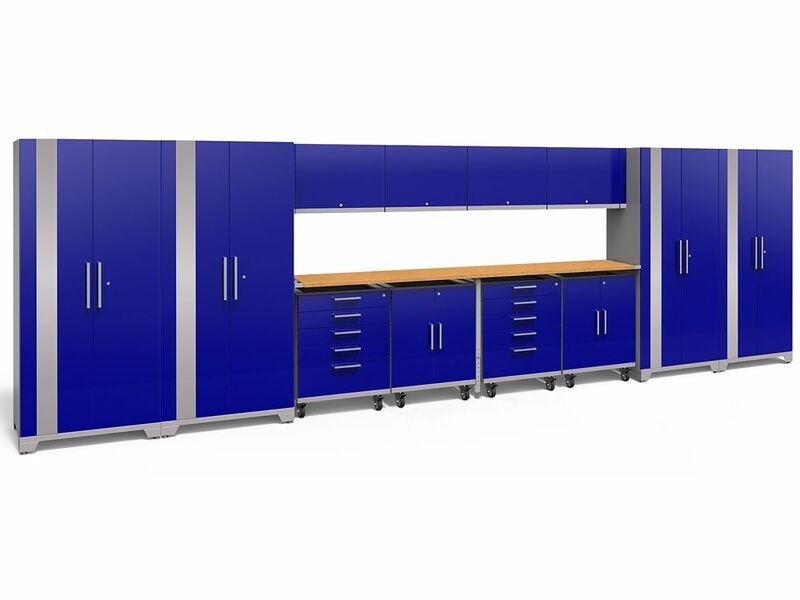 Performance Plus 2.0 Series 14-Piece Mobile Set in Blue Bring your garage into the 21st century with our newly redesigned, Performance Plus 2.0 Series; our first fully mobile, modular garage cabinet series yet! Each cabinet features fully welded, 18 gauge steel frames with fully lockable double-walled doors; that's 100% stronger than our Performance Series! Weve included soft-close door hinges, adjustable steel shelving, full extension drawers, integrated top tool trays on your base and tool cabinets and many more premium features. Our newly designed Mobile Spacer Kit allows you to change your once static garage set into a fully functional mobile set; with included casters, your base and tool cabinets can now slide in and out of your set with ease, leaving your worktop stationed. Performance Plus 2.0 Series 14-Piece Mobile Set in Blue is rated 4.4 out of 5 by 7. Rated 2 out of 5 by SAMMCM2 from Like the system however several doors were dented and one... Like the system however several doors were dented and one of the bamboo surfaces were damaged. Rated 5 out of 5 by JamesB from The Performance Plus 2.0 80 in. H x 266 in. W x 24 in. D Steel Garage Cabinet Set in Blue (14-Pie... The Performance Plus 2.0 80 in. H x 266 in. W x 24 in. D Steel Garage Cabinet Set in Blue (14-Piece) is an amazing system and we love it. It arrived as assembled cabinets with thick double wall construction. The only assembly it required was installing the feet, casters and door handles. Two of us were able to unbox and completely install on a Saturday. Instructions were clear and only required a few basic tools. Very impressed with the system!